What a whirlwind week! 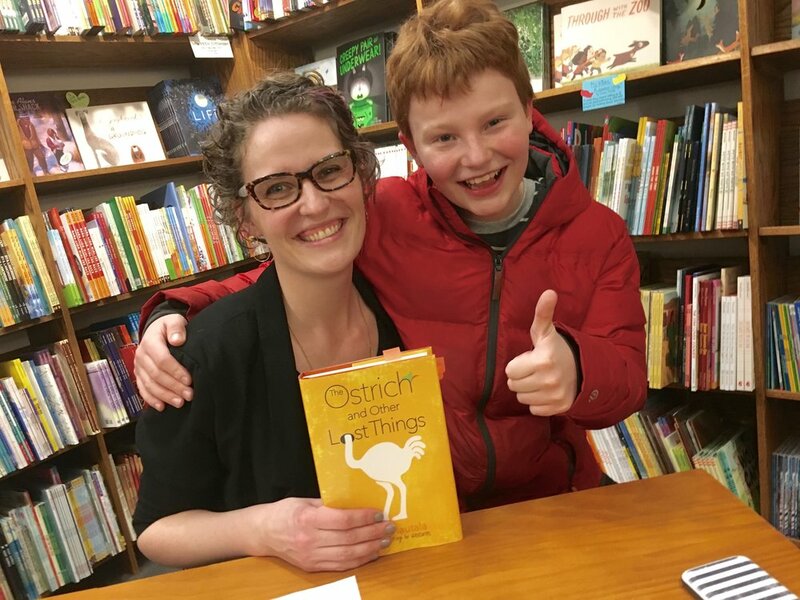 I spent the front half of last week wrapping up details for a two-day school visit, and the back half celebrating the release of The Ostrich And Other Lost Things. I am absolutely overcome with gratitude. There’s nothing quite like the feeling of taking something you have worked tremendously hard to create and craft and wield and hone and offering it in shaky hands to the world. And then you let it go. You watch it walk home under arms and stuffed into book bags. You watch it hugged to chests and casually flipped through, pages fluttering nervously. You watch as it’s shared with friends and family, passed between hands, and hopefully, hearts. It’s a tremendously humbling thing—letting a book go. And as I sit at my desk this morning, all I can say, really, is thank you. If it were not for lovely readers like yourselves, storytellers (like myself) would be little more than traveling minstrels. And for someone not as musically inclined as perhaps I ought to be, that would be a rather unfortunate thing. But because of you, I can set pen to paper and let my heart and imagination go wild. And together we can travel paces, and learn things, feel things, wear the shoes of friends and soon-to-be friends, and discover something about ourselves along the way. Telling stories is the greatest gift I always dreamed I'd get to experience. Thanks for supporting my dreams! And an extra special thanks to The Red Balloon Bookshop in St. Paul, MN for being such a wonderful host! You guys throw a fantastic book release party, and it was such a delight to come back and celebrate a new book with you guys. Thanks for everything! Just a quick note of thanks for everyone who participated in The Ostrich And Other Lost Things book swag giveaway! I have a nice pile of fun stuff to get in the mail. If you weren't on the winning end of this little shindig, I'll be bringing swag to signings—and I look forward to seeing you there! I have some lovely book swag to give away before the release of The Ostrich And Other Lost Things on February 20th! I am giving five winners a chance to win a pack of stickers and two quote cards (to be used as bookmarks, coffee coasters, a solid reminder of good things stuck on your bathroom mirror, a place to stick your gum at night . . .or whatever). All I need from you is proof of a pre-order purchase of The Ostrich and Other Lost Things. Send me a screen-shot of your purchase order (beth@writingwordbyword.com) and your name will be entered in the drawing. If I pick your name, I'll send you an email, get your address, and send you your winnings! 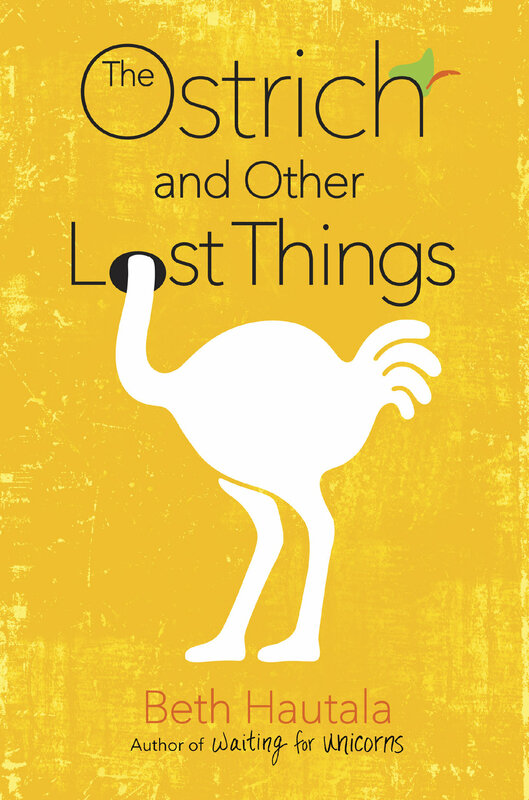 If you have ALREADY preordered a copy of The Ostrich and Other Lost Things, you can STILL WIN! Just send me a screenshot of your already pre-ordered purchase (to beth@writingwordbyword.com) and I'll enter your name in the drawing. I will pick five winners from the already-pre-ordered group, email you if I choose your name, snag your address, and send your swag off via US Post. Thanks for playing along everyone and GOOD LUCK! It's been over two years since my first book WAITING FOR UNICORNS released, and since then I've been working diligently to bring a brand new story to life. Today I am delighted to revel that story's official title, cover, description, and release date with you! Presenting . . . (drum roll please) . . .
Eleven-year-old Olivia Grant has a knack for finding lost things. She can find lost rings, pets, and even her elderly neighbor's misplaced glasses. 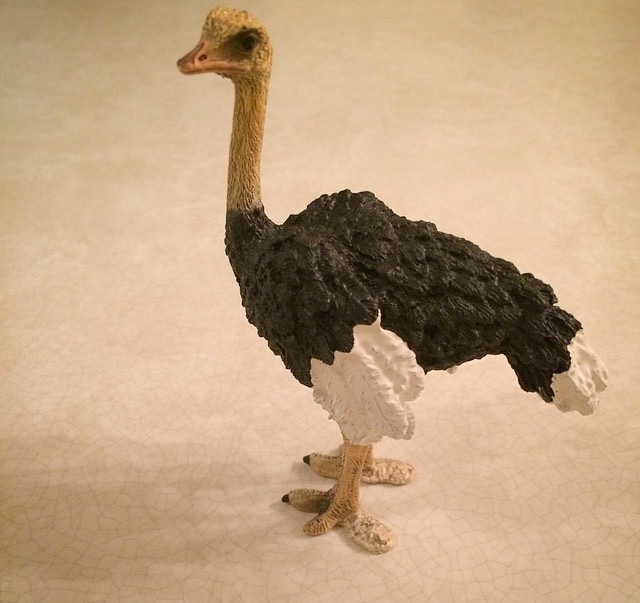 There's only one thing Olivia has never been able to find--her brother Jacob's toy ostrich. It wasn't until the day Jacob lost his ostrich that Olivia noticed how different he was: Jacob is autistic, and though she's his little sister, Olivia often feels like the older of the pair, his caretaker. And with her parents so heavily focused on maintaining status quo for Jacob, it's Olivia who has stagnated in his shadow--unable to explore new opportunities, or to be her own person. In fact, apart from being Jacob's sister, Olivia's not really sure who she is. So when summer break begins, and the local community theater announces auditions for an all children's production of her favorite show, Peter Pan, Olivia jumps at the chance to claim something for herself. But what begins as a promising opportunity and a wonderful escape quickly becomes pure chaos. The visiting zoo with an odd assortment of animals--including an ostrich that causes even more trouble than Jacob's missing toy--only make matters worse, as Olivia's summer is shaping up to be just as consumed by Jacob's needs as the rest of her life has been. In time, and with the help of some unlikely alliances, Olivia must learn what it means to be separate from her brother and still love him, how to love herself in spite of her own flaws, and that not all lost things are meant to be found. In this beautifully written novel, the bonds and challenges of caring for a sibling with autism are bravely explored, along with the pain and power that comes from self-discovery. This story is very dear to my heart. My team at Philomel/Penguin has been absolutely fantastic and I couldn't be happier about how this story has grown and developed. I am so excited to share it with all of you! I feel like I've been waiting MONTHS to share this, and now I finally can! It is with such delight that I can finally say, I have another book on the way! THE OSTRICH AND OTHER LOST THINGS found a home with Philomel/Penguin this week, and I am overjoyed to be working with the marvelous people there once more. Thanks for all the warmth and support, my friends! I can't wait to share this new book with you! Stay tuned for updates! Olivia Grant, finder-of-lost-things-extraordinaire, is afraid of becoming just like her Autistic older brother. And she has a list of things she can never do—things her brother does all the time—to help keep her in check. But Olivia’s Neverdo list gets pretty messy when she unintentionally breaks the law. And as punishment, spends her summer in community service at the local zoo. To complicate matters, one of the zoo animals, an ostrich named Marge, keeps escaping her pen and showing up in Olivia’s backyard. Getting the part of Wendy in the summer theatre production of Peter Pan helps ease sting of community service and gives Olivia a chance to finally do something for herself—something her brother can’t mess up. But those hopes are dashed when her brother unexpectedly gets the part of Peter and throws everything into jeopardy. An unexpected friendship with the zookeeper’s son Peter, who happens to be blind, starts to open Olivia’s eyes to the beauty of being different. And together Peter and Olivia set out to uncover the mystery of the escaping ostrich. But as her list of Neverdos grows, Olivia starts running out of time to find the one missing thing that will fix her brother, and save her from becoming like him. But when Jacob finally does the unthinkable and ruins everything, Olivia looses her temper, and Jacob disappears. With fear and guilt chasing her down, she must come to realize that sometimes life is a zoo. And learning to love others despite their lostness, and love yourself despite your mistakes is hard work. Harder than cleaning out monkey cages, or standing on stage, or finding a missing Ostrich. Often things that can’t be found leave room for the things that never go missing, and Olivia discovers that she has something beautiful to offer the world, no matter how lost or found she is. This past Thursday evening I had a chance to sit down and talk about Waiting For Unicorns at my hometown library. I know it's going to sound odd, but this was an event of a lifetime for me. Here's why:I grew up in this library. I came two, even three times a week and the librarian knew me by name. She never even asked for my library card—she knew my number by heart. I came because I was welcome. And I came to peruse the books and make sure I hadn't missed any new ones. I knew where all of my favorites lived in the stacks. Peter Pan, Where the Red Fern Grows, Pride and Prejudice, Caddie Woodlawn, My Side of The Mountain, The Secret Garden, Anne of Green Gables, The Story Girl . . . and so, so many more. These were my dear friends growing up, and the library was their home. I used to stand and gaze around me wondering what it would be like to have a story of my own living among the books I loved so much. And last Thursday that childhood imagining became reality. Waiting For Unicorns now resides on a shelf at the Jessie F. Hallett Memorial Library in Crosby, Minnesota. To the staff at the Library, especially Peggi, thank you for this precious gift. For keeping me in stories and for allowing me to find my way, one book at a time, into adulthood. I've been richly blessed by those who poured time and energy into that place and into me. Thank you for letting me share my own story and call the library home in a whole new way. Friday night, The Red Balloon Bookshop hosted a launch party for Waiting For Unicorns, and let me tell you, the ladies running the show there not only love books, but they know how to throw a beautiful party. I was so warmly welcomed, I considered simply curling up and making Home right there in the stacks. After all, what better place to call home than a giant old house-turned-children's-bookshop? Many thanks to those who came and supported me, asking questions and talking about stories, to those who purchased my book and let me sign their copies. And a special thanks to Barb, Amy, Kate, and the rest of the staff at the Red Balloon. It was a night to remember! I‘ve tried to write this post four times today. I keep trying to adequately formulate words to match the emotion that’s hovering over this day—the day my first book has come to life. I work in words. Have done for most of my life, so you would think I could arrange a few in this regard. . . . I wanted to start out by trying to tell you how this book came together, but that doesn’t really seem relevant to today. And then I wanted to tell you about my writing process—talk about story arc and syntax, research, development, and editorial details. But sometimes that comes off sounding vain and slightly stuck-up, so I dead-ended there too. Then I imagined saying something witty and flattering about traditional publishing—but that’s all been said before, by people far more skilled with the written word than I. So all I’m really left with, at least for now, is this giant overwhelming expression of gratitude. And that feels right. And perhaps I’ll come off sounding a bit overly earnest and a tiny bit too sincere, but this is a big day for me. So I trust you’ll forgive me. Many people make a book. —Yes, the author writes it. No doubt there. But before pen ever meets the page there are people who pour love and time and build memories so the story has some kind of foundation to stand on. There are people who give a writer the tools she needs to write. The people who teach her to read, who teach her to hold a pencil, who patiently read aloud to her until she falls in love with words. There are the professors and the critique partners, the counselors and the friends, the proofreaders and the editors, the bloggers and blog readers, and other authors who teach her what good writing looks like. After that come people who gave her the story she finally tells—the ones on whom her characters and their experiences are loosely or emotionally based. There are people who give her daily challenges and motivate her to press on, people who encourage her, tell her it can be done, and some who tell her it can’t. There are those who transform the story into an actual book. The people of red pen and grammar rules, the ones of ink and paper, editorial prowess and story-arc policing. The cover designers and ISBN number recorders, the filers and e-mailers, press-release senders, and galley-copy distributers, the sales team and book-shop owners. —And others, so many others I don’t have names for, who have ultimately left fingerprints in my life, and thus in every book I will ever write. Every story I will ever tell. This post is for them. For you. Please know that I have told my story—my first story—to the best of my ability. It is the best version of itself. Thank you for giving me WAITING FOR UNICORNS. Today I give it back to you. Congratulations Annette, you have won the final ARC giveaway! Please message me with your postal address and I'll drop a copy of WAITING FOR UNICORNS in the mail. Thank you all for participating, for leaving your comments, and as always, for being readers. For those of you who did not win and would like a copy, WAITING FOR UNICORNS is finally on shelves and available for purchase tomorrow! Today, January 15, 2015, marks the one-week countdown to book birthday! Seven days left, friends! And by way of celebrating, I'm giving away one last ARC (Advanced Reader Copy). After this (on Jan 22nd), you'll be able to find hardcover copies of Waiting For Unicorns wherever books are sold! Leave me a comment below with your name and the title of the last really good book you read. I'll choose a name and post the winner on Wednesday, January 21! On your mark . . . get set . . . LET THE COUNTDOWN BEGIN! Due to the kind sharing of this post via my publisher, I am adding one additional book to this giveaway, and will choose another winning name at random on Wednesday, Jan 22. Jamie Erickson has won the first giveaway and will receive an ARC as originally noted. But a second winner will be chosen as well. Thank you all for your comments and good luck! So, I have a book coming out in about a month and a half! And there's going to be a party! I'll be there with this book. —But like, the real one. Hardcover. And they will finally be available for you to take home. I'll be signing books and talking about Waiting For Unicorns. More details will follow so stay tuned! I've found lately that technology is making it very easy to go through life distracted. Some days I must actively force myself to set my phone aside, close my computer, and look around. Or conversely, take a breath from the chaos of family life, step outside, and look around. As a writer, noticing is very important. So I work to practice it. Whenever I am just sitting, waiting for something (grocery line, doctor appointment, at the stoplight, etc) I look around and try to 'write' the place in my head as though I were writing a letter to a friend who had never been to, nor could imagine the place I was currently occupying. It's a good practice, and it makes me an active participant in my own life. What is one thing you have noticed because you were actively paying attention that you otherwise would have missed or missed out on? Or, have you ever missed something that you wish you could go back and notice more fully? Leave your response in the comments for a chance to win one of three ARCs of WAITING FOR UNICORNS. Winners will be announced Monday Dec 8th. Is there a particular story that holds great weight in your life? Or perhaps a particular storyteller whose tales you find especially moving or profound? I love hearing the stories that connect us—that pull us all together and cause us to think (or sometimes say aloud), "Yes! Me too!" It makes me feel alive and not alone. Thanks for sharing your stories! Please email me your mailing addresses, at beth(at)writingwordbyword(dot)com, so I can get your copy of WAITING FOR UNICORNS on its way to your doorstep. In WAITING FOR UNICORNS, this is how Talia's mother explains the value of telling a story to her daughter. Essentially, it's the idea that stories hold weight, because we are recounting (to ourselves and to others) bits and pieces of human experience. We are reminding each other what it means to be alive! Leave your response in the comments for a chance to win one of three ARCs of WAITING FOR UNICORNS. Winners will be announced Wednesday Dec 3rd. Do you have a memory, uniquely yours, of a person or a place or an event? Have you ever found that someone else also has a memory of that same person, place, or event, but that it is completely different? Has it surprised you? Has it made your own memory better or worse, or just different? Week six giveaway will be posted shortly for another chance to win one of three ARCs! Sorry we are off to a late start on the giveaway this week! I'm backing up the week's deadline so you have a bit more time to participate before I choose the winning names. This week I want to touch on the significance of memory in everyday life . . . In WAITING FOR UNICORNS, Talia has been surviving emotionally off memories of her mother. —The way she looked, the things they did together, her words, her stories . . . But Talia comes to find that she is not the only one who has memories of this woman who is so special to her. Also, she has brought herself into each of her memories. As do we all. Someone else may 'know' someone we have also known, but know them differently! Just as our relationships in real time are unique, our memories—past tense—are also unique. Even when they orbit the same thing. Leave your response in the comments for a chance to win one of three ARCs of WAITING FOR UNICORNS. Winners will be announced Wednesday Nov 26th. Is there a Place in your own narrative—in your own life story—that holds significant meaning to you? Did it reflect changes in your life for a season? Did it become a refuge? Is it a place to which, you ever wish to return? Week five giveaway will be posted shortly for another chance to win one of three ARCs! As a storyteller, the idea of Place is quite significant to a story's authenticity. In fiction, it has to feel real, even if it isn't. In Nonfiction, is has to be real or the narrative lacks integrity. In the case of WAITING FOR UNICORNS, Place became both a way to ground the story—situate it in the world—and a way to expose some of the main character's internal processing. Her emotions were often reflected in what was happening across the landscape. Question #4) Is there a Place in your own narrative—in your own life story—that holds significant meaning to you? Did it reflect changes in your life for a season? Did it become a refuge? Is it a place to which, you ever wish to return? Leave your response in the comments for a chance to win one of three ARCs of WAITING FOR UNICORNS. Winners will be announced Monday Nov 17th. Week Three ARC Giveaway Winners! Do you have a friend, or have you ever had a friend, who stepped into your life exactly when you needed him/her, and lifted the load a bit—or simply helped you see that you were not alone? Your responses were fantastic. I love how there are people in our lives—every one of us—who have supported and helped us out in various meaningful ways. We leave our fingerprints in the lives of others, and that is an amazing thought! Week four giveaway will be posted shortly for another chance to win one of three ARCs!